Its been a long time since I quilted my Totally Groovy quilt. This was my first large quilt and sometimes I feel if I work on this alone nothing else will be get done. So, this has been put away for a long time. This week I quilted some more of my continuous feathers. You can see that I gradually change the scale of my quilting. Quilting in 1/2inch scale seems to be so easy when compared to large scale 1.5inch scale. At least I made some progress with my groovy quilt. 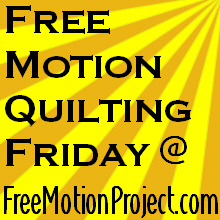 Now linking it with Leah Day's FMQ Friday. Looking great so far! Maintaining a certain scale is tough, but the great thing with this quilt is that you can vary the scale.